Updated: Israeli soldiers invaded, on Thursday at dawn, many Palestinian communities in several parts of the occupied West Bank, violently searched homes and abducted fourteen Palestinians, including a legislator. 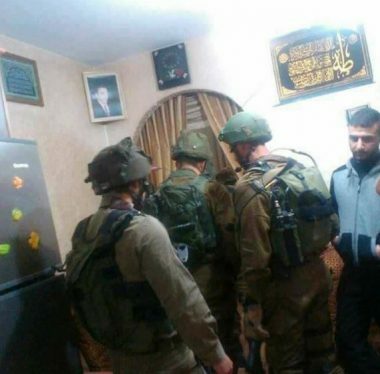 Dozens of soldiers invaded Silwan town, south of the Al-Aqsa Mosque in occupied Jerusalem, searched many homes and abducted Ahmad Jalal al-A’war, 21, Ali Sabri Abu Diab, 22, Mohammad Majdi Qa’qour and Mahdi Yousef Abu Diab, 18. The Bethlehem office of the Palestinian Prisoners’ Society (PPS) said the soldiers invaded the home of Legislator Khaled Tafesh, in his fifties, before abducting him. Tafesh was repeatedly abducted and imprisoned by Israel, including being held for extended periods under Administrative Detention orders, without charges or trial. Also in Bethlehem, the soldiers invaded the Saff and al-Maslakh streets, searched many homes and abducted Mohammad Waleed al-Hreimi and Issa Nader Awwad. Among the abducted Palestinians in Bethlehem is Issa Awad, who was previously shot by the army during a military invasion into Bethlehem. The soldiers also fired gas bombs, concussion grenades and rubber-coated steel bullets at many Palestinians, who protested the invasion and hurled stones at the invaded jeeps. In addition, the soldiers abducted a young man, identified as Ibrahim Marwan Hanaisha, 26, from Jenin, in northern West Bank, after summoning him for interrogation in Salem military base, west of Jenin. In Tulkarem, also in northern West Bank, the soldiers abducted Husam Khaled Tammam, 34, from his home. In Ramallah, in central West Bank, the soldiers also searched several homes and abducted Anas Mahmoud Nasser, 17, from Deir Qaddis town, west of the city. Fadel Ibrahim Abu Salem, Askar refugee camp – Nablus. Issam Ramzi, Iskaka – Salfit. Mo’tasem Mer’ey, Qarawat Bani Hassan – Salfit. Ibrahim Marwan Hanaisha, Qalatia – Jenin. Anas Mahmoud Nasser, 17, Deir Qaddis – Ramallah. Ahmad Jalal al-A’war, 21, Jerusalem. Ali Sabri Abu Diab, 22, Jerusalem. Mahdi Yousef Abu Diab, 18, Jerusalem.